Triangulo engineered and solid hardwood floors. 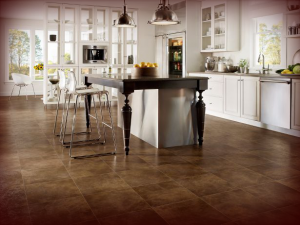 It’s a name that has been around since 1972 and has striven to meet the hardwood flooring demands of consumers abroad. There is nothing complicated about Triangulo. 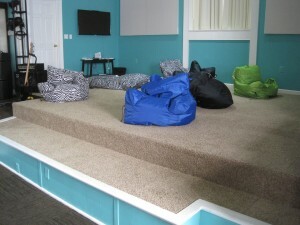 The flooring is beautiful if installed correctly and maintained correctly, plain and simple. 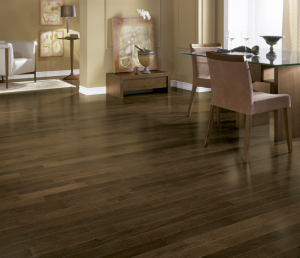 This is a sturdy hardwood or engineered floor of yesteryear with the modern improvement of advanced urethane coatings and aluminum oxide to harden the finish. Triangulo Exotic Hardwoods offers a number of varieties in both solid hardwood and engineered flooring, but we are going to review two products. The Jatoba Brazilian cherry engineered wood flooring and the Brazilian chestnut solid wood flooring. The Brazilian Chestnut is dark and rich with a smoky finish. The Brazilian chestnut exotic solid hardwood installs with a unique look each time, so even if your neighbor sees your floor and decides to install it as well, your floor will still be an original. Triangulo applies up to 9 coats of a crystal clear aluminum oxide enhanced urethane to make the flooring very durable and great to look at. Like all solid wood floors the Triangulo solid flooring can be sanded down and a new finish applied for years. 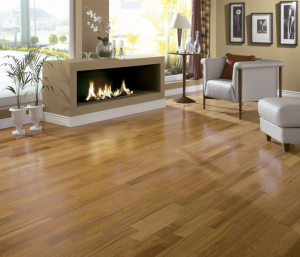 So many years in fact, that it is not unheard of the solid wood flooring lasting longer that you will own the home. The Triangulo solid hardwood floor we reviewed came in 5 and 1/4 inch planks that were 3/4 inch thick with a tongue and groove for joining the planks at installation. The Jatoba Brazilian Cherry has a stunning glow in its finish. The engineered hard wood flooring from Triangulo, in particular the Jatoba Brazilian cherry, are stunning in their natural patterns and stains. The 5 inch plank engineered flooring is actually a stronger and more durable floor than solid hardwood due to the real wood plies that are pressurized as they are glued together in multiple directions. The cross-ply manufacturing technique along with the fact that this flooring is less susceptible to shrinkage or expansion (caused by the environment the floor is in) makes it possible to install the Triangulo engineered floor over concrete slab in multiple applications. You can’t do that with the solid hardwoods. If you are looking for hardwood flooring for your home or office then you are sure to have questions about the flooring and the warranty for it. 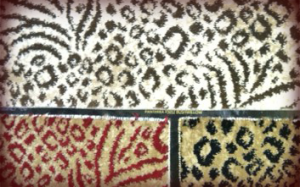 American Carpet Wholesalers has a very experienced staff that can help guide you to the best combination of quality, durability, ease of installation, and pricing. Triangulo has a Limited Residential Warranty and if you are considering purchasing Triangulo products you owe to yourself and your project to learn all you can about it. To make it even more convenient for you, American Carpet Wholesalers has an online chat available to you while you browse the selection on their website. So you can call, e-mail, or chat with a knowledgable flooring company with decades of staff experience. To view the entire Triangulo line of solid hardwood or engineered wood flooring visit the American Carpet Wholesale site. Or give them a call at 800-548-2706 to discuss your options. Flooring problems! Is it the product or is it the installation? When things go horribly wrong.